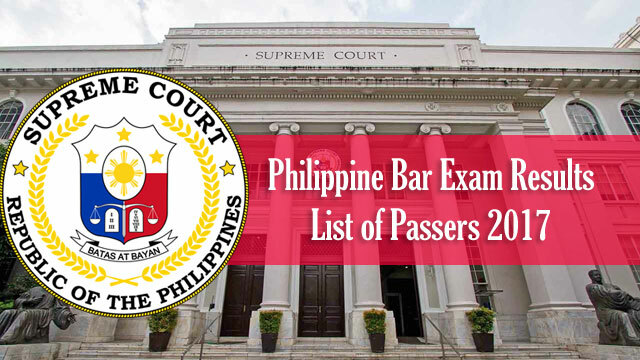 The Supreme Court revealed earlier this afternoon the list of Bar Exam passers for 2017. Out of 6748 law graduates, only 1724 passed which is 25.5 % passing rate for those who took last November. It is also a huge drop from 2016’s 59.06% rating or 3747 passers out of 6344. Mark John Simondo of DLSU - Bacolod bested other takers with a passing rate of 91.050 %. It is reportedly the 1st time in 16 years that a top notcher got a 90% passing mark. The last time was Arlene Maneja from UST with 92.9% in 2002. Meanwhile, those who will complete the top 10 are as follows: Christianne Mae Balili of University of San Carlos (90.80%), Camille Remoroza of Ateneo De Davao University (90.7%), Ivanne D’laureil Hisoler of University of San Carlos (89.55%), Monica Anne Yap of San Beda College (89.45%), Lorenzo Luigi Gayya of University of Santo Tomas (89.1 %), Rheland Servacio of University of San Carlos (89.0%), Krizza Fe Alcantara – Bagni of St Mary’s University and Algie Kwillon Mariacos of San Beda College (88.9%) Klinton Torralba of UST ( 88.65 %) and Emma Ruby Aguilar UST (88.4%). 814. HISOLER, Ivanne D'laureil I. 1037. MANDIGUARIN, Nadia Christine L.
1039. MANGAGOM, Joy Claire B. 1040. MANGASER, Roslyn Bianca R.
1044. MANIQUIS, Jann Paolo P.
1045. MANLANGIT, Mark Deo B. 1047. MANZANES, Rigel Kent P.
1050. MAPUTOL, Alfredo Miguel D.
1051. MARANAN, Christopher Ryan R.
1054. MARAÑO, Rebbekah Grace G.
1055. MARAÑON, Robert Ian G.
1056. MARBELLA, Jose Paolo B. 1057. MARCAIDA, Ida Marie S.
1059. MARCELO, Natasha Daphne S.
1060. MARCELO, Pamela Marie T.
1063. MARI, Ruel Nico R.
1064. MARIACOS, Algie Kwillon B. 1065. MARIANO, Diana Grace J. 1068. MARIFOSQUE, Anna Mariela O. 1069. MARQUEZ, Kevin Buen L.
1070. MARQUEZ, Ruby Jean B. 1072. MARTINEZ, Jose Audie Rustum R.
1074. MARTIREZ, Alma Alexandra L.
1076. MATALANG, Angeline Trinity Y. 1078. MATEO, Raemond Edward A. 1079. MATIAS, Joseph Edward L.
1080. MATIAS, Ma. Lourdes C.
1081. MATIENZO, Dowie Mae M.
1082. MATTA, Camille Jan G.
1083. MAURILLO, Monique Therese P.
1084. MAUYAG, Ayesha Ryka P.
1085. MAYOR, Aicel Joy J. 1086. MAYOR, Kerwin Rey B. 1087. MEDEL, Hyacinth Rose P.
1088. MEDINA, Anna Katrina P.
1089. MEDINA, Fatima Marie B. 1090. MEDINA, Joselito Edgar E.
1091. MEDITAR, Nasiff Brian O. 1095. MEJOS, Mera Grace A. 1293. PIMPING, Moh'd Naif S.
The examinees took 8 subjects for 4 consecutive Sundays such as Civil Law and Taxation, Political Law and Labor Law, Remedial Law and Legal Ethics and Practical Exercises and Mercantile Law and Criminal Law. Congratulations to all passers. May all of you be the future of our country to promote justice.